JUST REDUCED! 1925, 4 bedroom, 2 bath, 1577 sq. ft. home on a 90 x 130, 11,326 sq. ft. parcel. ALL COPPER PLUMBING! New kitchen and dining room sub-floor, 2014 water heater, 2 year old carpet, newer wall heater, toilets and faucets. Screened in front porch. 2 wall air conditioning units and 1 evaporative cooler. Connected to sewer. Completely fenced. Detached 576 sq. ft. garage. BUSINESS PARK Zoning. Includes 65 x 40, 2,178 sq. ft. parcel behind garage for a total of 13,504 sq ft. Across the street from a neighborhood convenience store. Easy access from Old Frontage Rd & the I-215. Close to Day Street commercial shopping area. Minutes to Costco, Sams Club, Target, Walmart, Pet Smart, Gas Stations, Restaurants, & Mall. Close to I-215, I-15 and 60 Fwy. New Metrolink station. (now open). 13,500 sq. ft. 105 x 130 vacant corner lot available for total of 27,154 business park zoned square feet. 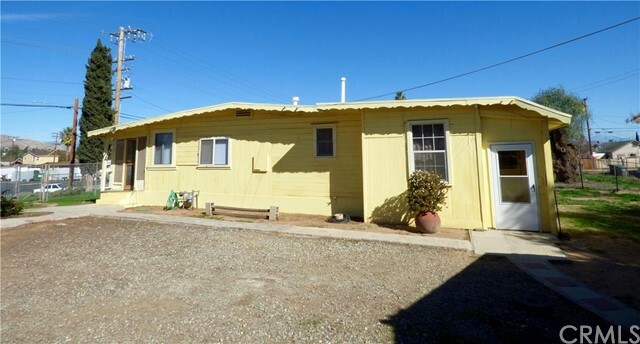 HOLD or build on corner & live in or rent this well-maintained home as income. Rental properties are @ a premium, due to new residential, commercial & industrial construction. Moreno Valley is home of the World Logistic Center. Inland Empire is the fastest growing area in Southern California.